A look at the shows released by POST Wrestling over the past week, including a special tribute to the late Leon 'Vader' White, the launch of a new show hosted by Chris Charlton, a POST Production video outlining our recording schedule for the summer, and your usual favorites. Monday began with Rewind-A-Raw with John Pollock & Wai Ting chatting about the episode following Money in the Bank and kicking off with Ronda Rousey’s suspension angle. They also went through the announcements for the G1 blocks and the launch of the NXT UK brand, which was announced earlier that day during the WWE’s event at Royal Albert Hall. John & Wai have also begun a bonus show Monday for members of the POST Wrestling Café – featuring Wai’s Total Bellas review and any other material they couldn’t fit onto Rewind-A-Raw. This week’s Patreon-only show also featured an in-depth review of the recently released WWE ‘24’ special on The Hardys from the WWE Network with a look at their history, drug abuse, and Jeff Hardy’s recent DWI from March. Tuesday’s Rewind-A-SmackDown featured a lot of news off the top with the top story of Big Cass’ release by the WWE earlier in the day, as well as Joe Koff revealing that Ring of Honor had lost their date at Madison Square Garden after the venue was in contact with the WWE. As always, we had a big review of SmackDown, which was highlighted by a five-man gauntlet match that set up Rusev challenging for the WWE title next month at Extreme Rules against AJ Styles. 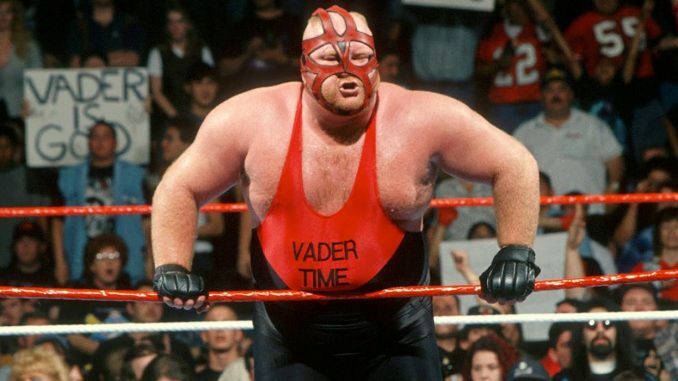 On Wednesday, the news of Leon “Vader” White’s passing was made public by his son. White died on Monday evening and it was the major story of the week. On the site, we had the opportunity to speak with Jim Ross and Bret Hart and had a lengthy obit on White’s career. Braden Herrington & Davie Portman did double duty over the week with their review of NXT TakeOver Chicago II and the follow-up HangOver Chicago episode on the WWE Network. With minimal storyline advancement on the post-TakeOver show, Braden & Davie went heavy on other topics, including the NXT UK announcement and the possibility of staging a WrestleMania event in the UK. The 13th installment of Rewind-A-Wai dropped on Friday on the POST Wrestling Café as Espresso Executive Producer (and long-time listener & supporter) Kris Ealy a.k.a. ‘Kris from L.A’ chose the ill-fated ABC pilot ‘TagTeam’ starring Jesse Ventura and Roddy Piper. The blackballed wrestlers seek a new career path as cops and the comedy ensues, while the series did not. The highlight of the pilot is the 1991 commercial inventory left in the YouTube upload of the show and we dissect each one. The next Rewind-A-Wai comes out Friday, July 6th and will be a review of WCW Uncensored 1997. John & Wai also released a POST PRODUCTION VIDEO for ‘Double Double’ and above members of the POST Wrestling Café detailing their entire podcast schedule for the summer. This includes their plan of attack to cover all the G1 cards as John has done in past years. Finally, we are happy to welcome Chris Charlton aboard with the Eggshells Companion Podcast as a complimentary listening experience for his upcoming book release. Each week, Charlton will review one year of wrestling cards at the Tokyo Dome, beginning with 1989 as New Japan Pro Wrestling and the UWF ran the Dome during its first full year of operation. Charlton is joined by Jojo Remy from the Voices of Wrestling site to tackle 1989. This show can be heard on the main POST Wrestling podcast feed. We have individual podcast feed for POST Wrestling, upNXT, Keep It 2000, and the British Wrestling Experience. All the information to subscribe to these feeds is available at https://www.postwrestling.com/subscribe/.